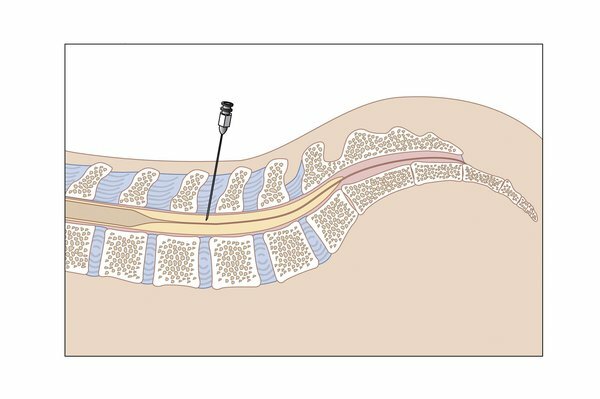 A lumbar puncture is where a thin needle is inserted between the bones in your lower spine. It shouldn't be painful, but you may have a headache and some back pain for a few days. It's carried out in hospital by a doctor or specialist nurse. Your doctor or nurse should explain what's going to happen and why you need a lumbar puncture. Clean your skin and numb the area with local anaesthetic (you'll be awake during the procedure). Children may also be given medicine to help them relax and keep still. Insert a thin needle through the skin, between 2 bones in the lower part of your spine. This shouldn't be painful, but you may feel some pressure. Remove the needle once the procedure is finished and apply a small plaster or dressing. How long does a lumbar puncture take? A lumbar puncture takes around 30 to 45 minutes, but you'll need to stay lying down at the hospital for at least another hour while the nurses monitor you. You'll be able to go home the same day if you feel well enough, but you won't be able to drive yourself home. The doctor or nurse who performs the lumbar puncture can often tell you some of the results straight away and explain what they mean. You may need to wait for at least 48 hours for the full results. Some laboratory test results are available within a couple of hours in an emergency. A lumbar puncture is generally a safe procedure and serious side effects are uncommon.